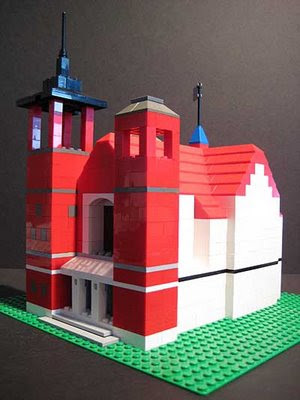 A Lego birdhouse model of St. Boniface Church at Chestnut and Noble, by Kuklinski + Rappe Architects. Artists and architects designed birdhouses are now being displayed at Alliance Bakery, City Soles, Stitch and other Wicker Park businesses. They'll be auctioned June 6 in a fundraising auction for A.N. Pritzker School, 2009 W. Schiller St. The pocket aviaries, no larger than 20 by 20 by 48 inches, were created for the group Friends of Pritzker, which is trying to raise $40,000 to build a preschool and kindergarten playground. See all the entries here. They'll be auctioned at a mixer from 6 till 10 p.m. at the studio of painter Wesley Kimler, 2046 W. Carroll Ave. The reception includes drinks and appetizers. Tickets are $25; $20 in advance. The craft fundraiser reflects the project's creative bent. Playbround plans call for painting easels and a stage as well as the more conventional swings, slide and sandbox. In a separate fund-raiser this weekend, the west end of the Do Division street festival at Division and Leavitt will benefit Pritzker and the LaSalle II Language Academy, 1148 N. Honore St. The Family Fun Fest includes a bounce house, face painting, crafts, cookie decorating, petting zoo, pony rides from noon until 6 p.m. May 30 and 31. The West Town Chicago Chamber of Commerce is the organizer.